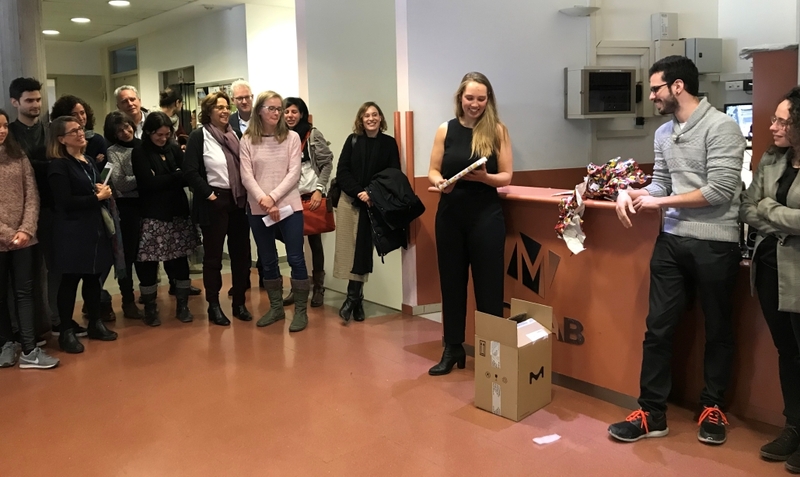 The members of the examining committee were: Pascal Jonkheijm (Universtiy of Twente, The Netherlands), Elena García-Fruitós (IRTA, Spain), Elena Martinez (IBEC, Spain). 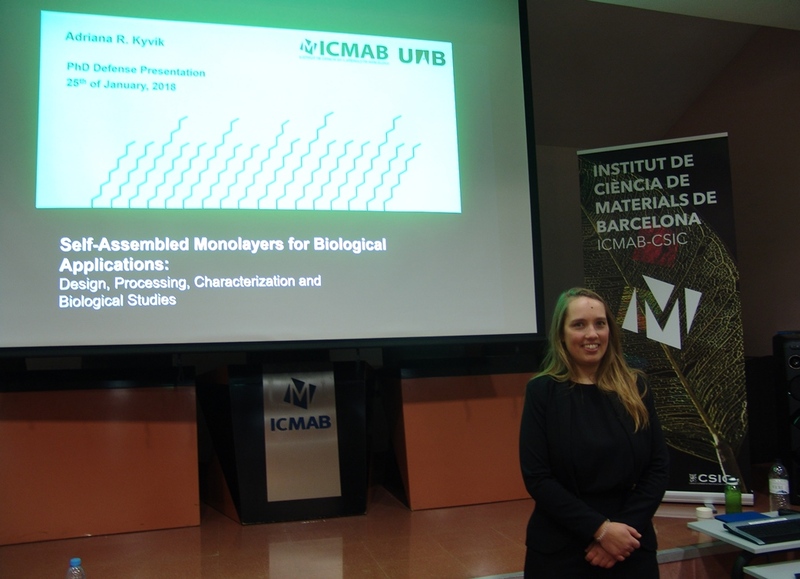 Dr. Adriana Kyvik did her Bachelor in Chemical Engineering and Biotechnology in Trondheim (Norway), and came to ICMAB to the NANOMOL group. She enjoys sports, cooking, dancing, traveling and learning languages. I chose ICMAB because it offered research englobing my interests. I have been performing research in the field of surface material modification to study biological phenomena. For example, how cells behave in response to different types of material coatings. This is very relevant in biology to study the behavior of cells and for applications in the biomedical field to develop new types of coating for medical devices. Fundamental biological studies or coatings of biomedical devices to avoid biofilm formation, such as coating for catheters to avoid bacterial infections. I have learned a lot during my stay at ICMAB and have developed myself at a scientific and academic level. Nonetheless, the social part of the Nanomol group: I have made very good friends and had fun outside the lab with my co-workers. I believe a PhD prepares you to be able to confront and solve problems, useful for industry or academia. To take a break and probably travel a bit before looking for a job. PhD Thesis Abstract: Self-assembled monolayers (SAMs) is a versatile strategy for surface functionalization to achieve functional and smart materials. In this research, SAMs on gold surfaces have been designed, processed, characterized and used as a surface biofunctionalization strategy for specific biological applications. The studies performed include the control of lipid bilayer diffusion, cell adhesion and tubulogenesis studies, and also the creation of antimicrobial surfaces. More specifically, dynamic SAMs on surfaces whose properties can be modified with an electrochemical external stimulus have been developed and used to interrogate biological systems.The same platform has been applied to two different applications in order to overcome present challenges when performing biological studies.